Morchella, or morel mushrooms, are a distinct-looking mushroom that have a segmented, porous cap and hollow insides. Morel mushrooms are hunted for their flavor and exotic appeal. Like many edible mushrooms, morel mushrooms can easily be mistaken for toxic varieties, which have a similar wrinkled appearance. Morchella semilibera, or black morels, are the first morels to begin growing during the season, and they can grow to be a foot tall. 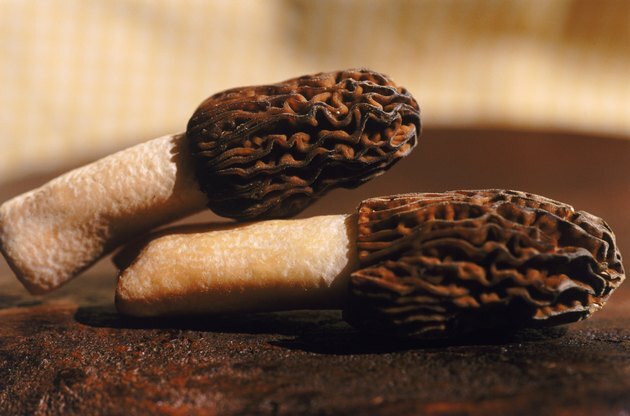 Black morels should be eaten with care, as they can cause allergic reactions and stomach upset. When trying black morels for the first time, eat a small amount and avoid alcohol. These mushrooms are also called gray morels because they start off gray and gradually turn black as they mature. Other common names include spikes, peckerheads and cows' heads. Morchella deliciosa, or yellow morels, are so called because of their yellow coloring, which can range from strong yellow to a white gray. They have a strong flavor and are the most popular morel mushroom for cooking. 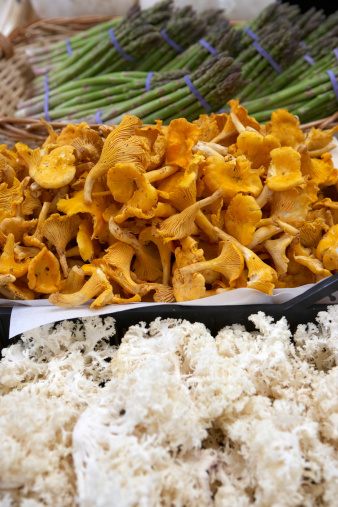 Yellow morels grow last in the season, which typically lasts from April to June. Common names include cream, white, sponge and blonds. Half-free morels have small caps that attach midway down the stem of the mushroom. Half-free morels, also called cows' head or peckerheads, tend to grow after the black morels have begun growing. Though smaller than other morels, half-free morels can also be used in cooking to the same effect. Like the other mushrooms, half-free morels are most often found in the Great Lakes area of the United States. What Is the Difference Between Shallots & Scallions?